The 1972 Olympics was to be a new Olympics symbolizing a new Germany with a new feeling of universal brotherhood. Then Arab terrorists seized 11 Israeli athletes, sparking memories of the Holocaust in the land that perpetrated it. Zman interviews Israeli Olympic delegate Shmuel Lalkin who was only a few feet away in the neighboring apartment at the time of the attack. He provides a fascinating yet harrowing and chilling insider’s account of this terrifying event. “We were slaves to Pharaoh in Egypt….” Slavery in modern times has been strongly denounced and much effort has been made to uproot it. Despite that, there are — shockingly — more slaves today than perhaps ever in world history! Zman takes a look at modern slavery and how we can use it as an opportunity to appreciate the words of the Haggadah telling us how fortunate we are that we are not enslaved. The discovery of the tomb of King Tutankhamun, a relatively minor pharaoh, with its fabulous treasures virtually intact, took the world by storm. Everyone could now see for the first time the unbelievable wealth that surrounded the monarchs of the ancient world’s most famous and imposing empire. Read about the discovery of the tomb and learn about its significance in the annals of history and in the eyes of the Torah. The news this past month was full of the story of Malaysia Airlines Flight 370 that disappeared on March 8. More than two dozen countries searched from land, air, space and sea for any visible sign of the plane. Two weeks of intense searching produced nothing. The plane simply disappeared. But this was not the first time in history that such an event caught the world’s attention. Read the stories of other airplanes that mysteriously vanished. Apollo 13: Disaster In Space! The entire world was transfixed. Many said it was the first time they prayed. It all began when the Apollo rocket heading toward the moon experienced a major malfunction. On the ground, specialists worked feverishly to develop a plan to return the astronauts to Earth. It was a race against time. Oxygen, heat and electricity on the craft were fast running out. A series of risky maneuvers were initiated in the slim hope of returning them alive. Would they succeed in time? It isn’t every day that children are featured in the news, but when a child does make headlines the circumstances are bound to be extraordinary, if not completely bizarre. Here is an array of curious reports about children that have captured the interest of the media and the public all over the world. Although there are many myths, legends and fictional stories depicting children reared by wild animals — such as dogs, wolves, apes and bears — modern day cases suggests that at least some of those legends may have been based on true accounts. As surreal as this may seem, there have been documented instances even today where children have been adopted and raised by animals. The only truly predictable thing about life is its unpredictability. Nowhere is this more evident, arguably, than in the lives of the most famous (and infamous) world leaders who had the most humble beginnings. Be it the billionaire who once waiting on tables… to the dictator who began as a peasant… to the current President of the United States who used to scooped ice cream, history (past and present) proves time and again that anything can and does happen. It has been called the shidduch crisis. In order to shed light on the nature of it and its possible causes, Zman interviewed Rabbi Moshe Pogrow, the director of NASI, the North American Shidduch Initiative. To provide a more complete picture, we also interviewed several shadchanim who have been involved in NASI shidduchim, including Mrs. Libby Lieberman, and mother of “older singles” who would potentially benefit from the program. Seventeen years ago, Rebbetzin Sora Bulka, along with Rabbi Yeshaya Levy, envisioned an educational institution that would achieve two different but related goals. The first was to provide young women with the proper values, skills and knowledge to become professionally involved in quality Jewish education. The second was to allow women to obtain degrees from respected universities while remaining in an environment committed to tzniyus and yiras shamayim. Thus was born The New Seminary. Munich, Germany – the birthplace of Naziism. The year is 1972, more than 27 years after the end of World War II and the horrors of the Holocaust. This was to be a new Olympics, symbolizing a new Germany with a new feeling of universal brotherhood and peace for all mankind. Then Arab terrorists infiltrated seized 11 Israeli athletes, sparking memories of the Holocaust in the land that perpetrated it. The world literally watched the horrific events unfold and wondered: Would negotiators and commandos be able to save the Jewish athletes in time? Vegetables and greens are an important part of Pesach tradition, and take a prominent role at the Seder. In this month’s special food section, Zman explores the wild world of insect infestation, and how to have your broccoli and eat it too! 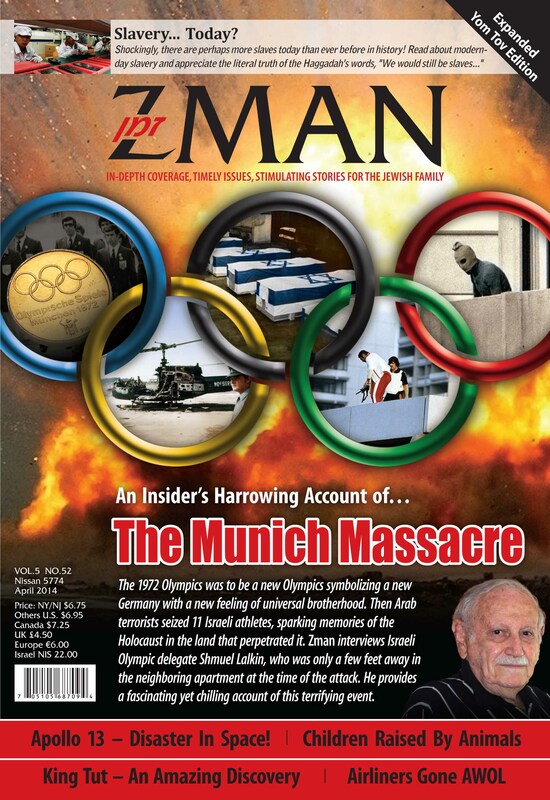 This entry was posted in Zman Magazine and tagged Apollo 13, Disaster, Drama, Excitement, Munich Massacre, Yaakov Astor, Zman Magazine. Remembering HaRav Shlomo Leib Brevda zt”l on his second Yartzeit on Shabbos Kodesh Parshas Va’era 5775. The Levaya that evening in Cong. Beis Yehuda in Boro Park. The Maspidim were HaRav Malkiel Kotler, HaRav Matisyohu Salomon, HaRav Dovid Shustal, HaRav Gershon Weiss, HaRav Chaim Eliezer Blau, his son HaRav Aharon, and others. The Aron arrived in Eretz Yisroel next afternoon. The weather in Eretz Yisroel was stormy the entire week with snow predicted that evening, but when the Aron was taken out for Kevurah the snow suddenly stopped till it was fully covered then it continued snowing. Thousands of people met the Aron at the airport and there were a few Hespedim said there. Then the Aron proceeded to Yerushalayim to Yeshiva Torah Ore. Thousands filled the Beis Medrash dining room and several other large rooms in and out of the building which were set up with loudspeakers. Because of the difficult weather that made it exceedingly difficult to get to Yerushalayim, a parallel Hesped was conducted in the Beis Medrash of the yeshiva Knesses Chizkiyahu in Kfar Chassidim and on Kol HaLashon etc. at the same time that the Levaya in Yerushalayim was going on. The first speaker in Yerushalayim was HaRav Yitzchok Ezrachi, Rosh yeshiva of Mir Yeshiva. HaRav Ezrachi said that HaRav Brevda was a man of blessing and even though he met him many times throughout his life he does not remember any time the he met him that he did not give him a blessing. He also said that HaRav Brevda was against the way that some people serve Hashem Melumodoh, through force of habit and only with their outward actions. HaRav Brevda spoke against this and was very effective with his Pikchus and his depth. As did many of the Maspidim say, he said that the Vilna Gaon would be expected to greet him since he dedicated so much effort to spreading his works. The Mashgiach HaRav Don Segal said that he was like Eliezer the servant of Avrohom who dipped and distributed the Torah of his master to all. His second son HaRav Velvel said that his father was dedicated to the Emes, truth, or, as he once put it, “Emes, Zichrono Livrochoh” meaning truth to a degree that is not found nowadays. He gave an example, that when his father finished high school in America, everyone, without exception, went to college. Someone suggested that he try something new called a “Yeshiva” so he joined the Mir Yeshiva for Elul and Yomim Noraim right after they arrived in NY. He was very impressed and won over. For the first time he saw how older men who seemed to be good people cried and worried over the Heavenly Judgment, Davening with tears. For Succos of that year he went back home to Crown Heights. His family Davened in a Shul of 800 As the only yeshiva Bochur in the Shul, something that was exceedingly rare in America, they asked him to say a few words. It was the first of thousands of speeches he gave throughout his life. The headline of his speech was”College Rachmono Litzlan.” (College g-d forbid) He said that when people grasped what he was saying they started throwing things at him and he had to hide under the table to save his life! Until they ran out of things to throw. Then he got up and finished what he had to say. His son also said that his father was full of Simcha when he praised his grandchildren who dress to the fullest extent of Hilchos Tznius, even dressing with a Shaul and a head covering (outside) as they did in Yrusalayim when Rav Brevda arrived there over 60 years ago, Rav Brevda blessed his grandchildren twice saying, that in the Zechus of their Tznius they will greet Moshiach in the near future. HaRav Shlomo Leib Brevda zt”l was born in America on 5 Adar 5691 (1931) His father Rav Moshe Yitzchok z”l from Baranovitch was a Cheder Rebbe. His mother Miriam o”h was from the Kantrovitz family from Zhettel. The Chofetz Chaim also came from Zhettel as did HaRav Zalman Sorotzkin who was the Rov there. His father Rav Moshe Yitzchok was the seventh generation descendant Ben Acher Ben (from his father’s side) of the Admor HaRav Chaim Chaikel of Amdor (in Lithuania) who was the author of the Sefer Chaim Vechessed and a Talmid of the Gra then from the Maggid of Mezritch. His mother was also a descendant of HaRav Chaim Chaikel of Amdor. Her father was HaRav Efraim Mordechai Halevi Epstein zt”l from Novgrodek near Minsk who was the author of Meiro Dachya on Pirkei Ovos, Machane Efraim on the Maharsha, and Gevuros Ha’Ari, a biography of his ancestor the author of HaPardes HaRav Aryeh Leib Halevi Epstein zt”l who was the Rebbe of the Yesod Veshoresh Ho’Avodoh. HaRav Efraim Mordechai Halevi Epstein was also descended from the Levush, the Maharal of Prague, the author of Ma’asei Hashem and Yosef Lekach, the Mahari Mintz and other Gedolei Doros from this well-known family. Rav Moshe Yitzchok had a special talent from teaching Torah and giving it over to his young students. Even though that at that time in America most of the younger generation abandoned their traditions when they grew older and did not even remain Shomrei Shabbos,whoever learned by Rav Moshe Yitzchok remained a Shomer Torah and Mitzvos. This was very unusual and it is attributed to his emphasis on the sweetness of the Ruchniyus and his patient teaching of each child in his special way. Therefore his students did not abandon his teaching when they grew older. Every place where Rav Bevda learned as a child his Rabbonim and Chaveirim thought very highly of him. From the beginning he was dedicated to searching for Emes, both in learning Torah and in Avodas Hashem. When the Mir Yeshiva reached America after the end of the War, they continued to run it as it had been run in Mir and Shanghai. At first they did not want to take in Bochurim who had grown up in America because they thought that in general they did not fit in well with the atmosphere of the yeshiva whose tone was set by mature Chachomim who were very advanced in Torah and Yiras Shomayim, as it had been in Lithuania in the earlier days. Hashgocho Elyona saw to it that one day they decided to change this approach a bit and to take in seven selected Bochurim from America including Rav Brevda. From then he became permanently attached to his Rebbe Muvhak, Maran Hamashgiach, HaRav Yechezkel Levenstein zt”l, who made a special Vaad for that group of American Bochurim where he taught them the basics of Yiras and Avodas Hashem. In later years the Mashgiach said that when he’ll come up to the next world and they might not find him worthy to enter Gan Eden he’ll tell them that his Talmid is Rav Shlomo Brevda and that will be a Zechus that will help him get whisked into Gan Eden right away. When the Mashgiach went to Eretz Yisroel, the Rav Brevda went to learn by HaRav Aharon Kotler zt”l in Lakewood. His learning and his holy Hanhogos made a big impact on the yeshiva, and when he told HaRav Aharon that he was thinking of going to learn in Eretz Yisroel, the Rosh Yeshiva asked him not to rush into doing that since his presence in Lakewood added a lot to the atmosphere. Rav Brevda once told his oldest son that his great interest in the Torah of the Gra he got from HaRav Aharon. It is well known that HaRav Aharon studied the Torah of the Gra and in his Shiurim he used to discuss what the Gra said and he used to praise the Gra and his Torah. This is what brought HaRav Brevda to dedicate himself so much to the study of the Torah of the Gra. Throughout this period he used to correspond with his Rebbe the Mashgiach zt”l, who eventually told him that he should come to learn in Eretz Yisroel and withdraw from the materialism that was rampant in the United States. When HaRav Brevda reached Eretz Yisroel and went in to see the Mashgiach, who at the time lived in Yerushalayim, the Mashgiach told him that he should go immediately to the Chazon Ish and to the Brisker Rov. HaRav Brevda developed a strong and close relationship with both of these Gedolei Hador. He would travel to Bnei Brak to speak with the Chazon Ish in learning. Sometimes when he asked the Mashgiach something, he would send him for an answer to the Chazon Ish. One time after HaRav Brevda came out from speaking with the Chazon Ish, the Chazon Ish told one of his companions, Der Bochur Ken Lernen (That Bochur knows how to learn Torah) and offered HaRav Brevda to stay with him in Bnai Brak and be his daily Cavrusa, but at that point he was already in Brisk. HaRav Brevda would tell some of his Chidushim to the Chazon Ish. The Chazon Ish enjoyed the Chidushim tremendously that HaRav Brevda told him. One time he even got up and kissed him after he had told him a particular Chiddush. At the advice of the Mashgiach, he would also go to the Brisker Rov and tell him over his Chidushei Torah. One time the Brisker Rov told him that he wants his son HaRav Yosef Dov Ber to begin saying Shiurim, and he wants HaRav Brevda to be his first Talmid. Therefore the Brisker Rov wanted to talk to him to see if he is truly worthy of this, and he made an appointment to do so. When HaRav Brevda arrived for the appointment, the Brisker Rov told his son HaRav Refoel to leave the room and to close the door behind him. The Rov sat down opposite him and drew close to him and told him several things in confidence. After that the Rov decided that he was worthy of being the first student in his son’s yeshiva. From then HaRav Brevda would learn with a Chavrusa in Mir, and go to hear the Shiurim of HaRav Berel Soloveitchik. He would also go to the Shmuzen that the Mashgiach used to say in his home for a select group of Bnei Aliya. In Tammuz 5714 he married Hinda Leah Tichye, the daughter of HaRav Avrohom Boruch Greenblat zt”l of Yerushalayim, who had moved there from Brisk where he had learned in the yeshiva of the Imrei Moshe. Together they built a true Torah home, founded on Torah and Chesed to the Klal and to the individual. Right after his marriage he learned in the kollel of Kamenetz in Yerushalayim, but later he moved to Bnei Brak where he learned in Kolel Chazon Ish and heard Shmuessim from the Mashgiach who had moved there to be in the Ponovezh yeshiva. From time to time he would go to Yerushalayim to speak with the Brisker Rov. It was during this period that he began to put special emphasis on the Torah of the Gra. On the orders of his Rebbe the Mashgiach zt”l, he used to be Marbitz Torah in Eretz Yisroel and in Chutz La’aretz. The Mashgiach always asked if he listened to him and gave Droshos in public, speaking from his heart to arouse his audience to grow in Torah, Tefillah and pure Yiras Somayim. In 5717 (1957) the Mashgiach sent him to New York and he gave him amazingly detailed instructions on how to be Mekarev Yidden. He followed the Mashgiach’s instructions and indeed he was successful and saved many many souls from falling to the pits and helped them along to the paths of righteousness and Kvishas Hayetzer. In 5721 (1961) he returned to Bnei Brak and to Kollel Chazon Ish, as well as to the Mashgiach with whom he was very close for the next six years. He gave Droshos of Chizuk, as his Rebbe insisted, and he advised Bochurim and Avreichim that the Mashgiach send to him. In 5723 there was a special Kinus for Chizuk of the Kollelim at HaRav Brevda’s home in Bnai Brak, with the participation of about 26 Gedolei Yisroel ztvk”l and Shlita, led by HaRav Shach and the Steipler Gaon. One of the main themes of the Kinus was the importance of learning through toil, and after the Kinus HaRav Brevda was charged with publishing the Sefer Ameiloh Shel Torah that developed this subject. Gedolei Yisroel sent him articles on the subject that were included in the Sefer. The Gedolim who participated in the Kinus, where effusive and praised the Kinus and the great benefit it brought to the cause of learning with toil and effort. Over the years HaRav Brevda used to go to HaRav Shach to speak over Divrei Torah and Hashkofoh. One time HaRav Shach visited HaRav Brevda on Chol Hamoed when he was not feeling well, and he heard from him an explanation of something the Gra said. HaRav Shach was overjoyed at the explanation, and he told his Talmidim, “Whoever has not heard and explanation like that one does not know what Simchas Yom Tov is.” HaRav Shach wrote him a wonderful Haskomah for his Sefer Eifoh Shleimoh on Tefillas Channah and Chad Gadya. In his Hesped, his son Reb Velvel said that when his father had finished that Sefer, he went to Maran HaRav Shach for a letter. HaRav Shach said that it was not a good time to write a letter. HaRav Brevda returned several times over a few months and each time HaRav Shach said that it was not a good enough time to write a letter for the Sefer. Suddenly, late on Erev Yom Kippur, there was a knock at HaRav Brevda’s door. It was HaRav Shach. He said that now is a good time to write a letter for a Sefer such as HaRav Brevda’s and proceeded to do so. In part the letter read, “The Rav HaGaon HaRav Brevda worked and toiled and he was successful and his efforts bore fruit. He has great knowledge of the sayings of the Gra and he knows how to uncover hidden things and hints in the writings of the Gra. May Hashem help him to publish and to enlighten the world with the brilliant sayings of the Gra zt”l. And may the Zchus of the Gra stand for him so that he will see the coming of Moshiach Tzikdeinu and Binyan Ariel.” HaRav Shach also gave him $1,000 towards the expenses of the Sefer, saying that he wanted to have the Zechus be a part of it. In 5728 the Mashgiach sent him to London with his family where he had to undergo a difficult operation for one of his kidneys. The Mashgiach suddenly told him that he should leave as soon as possible and take his family with him. The Mashgiach did not explain why, but he of course followed the advice. When he arrived in London he had the operation right away and the doctor said that if had waited much longer it would have not been possible to save the kidney. About two weeks later it became clear that he was not finished with the ailment, but would have to remain in London for treatment. The Mashgiach advised him to stay in London and to spread Torah there. At that point it became clear why the Mashgiach told him to take his family with him. He spent around 13 years in London and had many great Talmidim. In one of his letters, the Mashgiach wrote that although he should stay in London for now, “Your future is in Eretz Yisroel.” However, as long as the Mashgiach lived he did not give him permission to return to Eretz Yisroel and only several years after his passing HaRav Brevda asked Maran HaRav Shach zt”l who said he could return. In 5739 he returned to Eretz Yisroel, fulfilling the words of the Mashgiach. HaRav Shach told him that he must continue to give his Droshos, and the Steipler was also very insistent. The Steipler said that in earlier generations there where Maggidim in almost every Shul, but now one does not hear a good word of Chizuk. So he must continue speaking about Yiras Shomayim even in Eretz Yisroel to the Bnai Torah. When he used to talk about the Avodoh of the Cohen Godol on Yom Kippur, he made his audience feel like they were participating. When he spoke about Yetzias Mitzrayim, the audience used to feel like they were going out. He did this for many times in the year, including Purim, Chanukah, Aveilus for the Churban and Yomim Noraim. Many thousands changed their spiritual path after hearing his Droshos. He spoke from his heart but with his mind. Talmidei Chachomim and simple Jews eagerly came to hear him. The Emes was always the light that guided him. As his son said in a Hesped, he once called it “Emes, Zichrono Livrochoh.” Such a consistent and complete commitment to Emes is not common these days. He used to give out hundreds of thousands of shekels a year from the donations of friends and followers to needy and deserving families. He once said that he could do more in this area but his Rebbe the Mashgiach had made it clear that his main purpose in This World was to infuse spirituality into the souls of the Jewish people. He wrote many Seforim that are admired and used, including, Amoloh Shel Torah, Leil Shimurim, Yiboneh Hamikdosh, Yemei Rotzon, Lehodos Ulehaleil, Kiymu Vekiblu. Since his passing his sons have been writing more of his Droshes, Seforim by the name “Lev Shlomo” the editor in chief is his son Reb Aharon Shlit”a. The climax of his Torah publications was his series of Eifoh Shleimoh on the commentaries of the Gra. Six volumes were published so far: Tefillas Channah and Chad Gadya, Sefer Yonah, and Four volumes on Shir Hashirim. He carefully determined the correct readings, and also gathered cross references and parallels from the Gra’s many writings that shed light on his meaning. In 5748 Maran HaRav Shach advised him to seek treatment from doctors in the United States and since then he spent most of the year in the US, where he continued to spread Torah. He used to spend most of the Yom Tovim in Eretz Yisroel, and on occasion he would be able to spend other time in Eretz Yisroel as well. Whenever he was in Eretz Yisroel he would be extremely busy saying Droshos all over the country, usually four to seven each day. The last time he came to Eretz Yisroel was in Shvat 5772. In Adar he became very sick and he had Yissurim in several places in his body. On the 26th of Teves 5773, he suddenly suffered a fatal heart attack.